Paco Underhill is a relatively famous market researcher, specializing in retail. His first book, Why We Buy, came out while I was working at Amazon, and it was required reading for awhile. 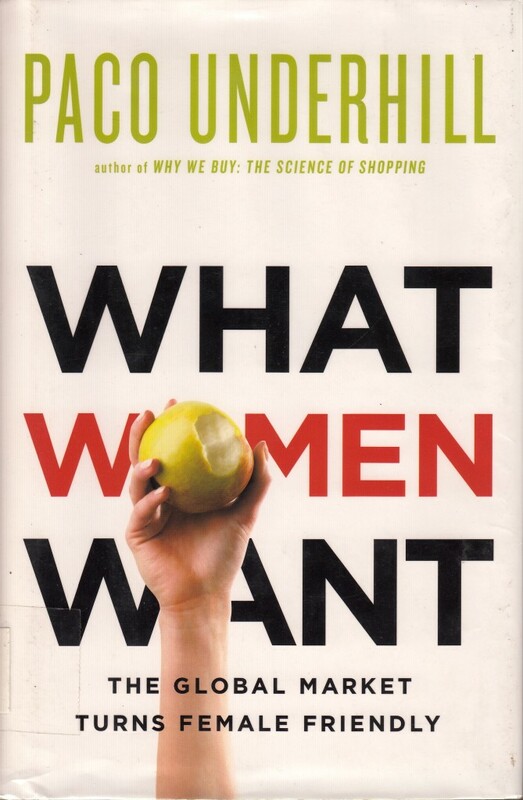 What Women Want is about the growing buying power of women, as more women earn their own money throughout the world. He covers some things that are more important to women than men (cleanliness, safety) and how stores and hotels put those concepts into play. He’s also good at backing up what he says with data. Paco Underhill has a successful market research business, and he’s conducted market research all over the world. He uses both that experience and the data he can get his hands on/share to write a good story about how global brands can appeal to women. That said, I do have a couple of quibbles. The first is that the book can get a bit man-splain-y, like “here, let me sit down and tell you how you as a woman tend to think.” But the information is good, so I’d urge you to do your best to grit your teeth and get past it. The second is that he glosses over the fact that wives control most of the money – something like 85% of it – spent jointly via a marriage. He emphasizes women spending their own money, but not how women influence how men and women spend money together. That was the larger problem, to my mind. Overall, though, it’s a well-researched and -written book. I’d recommend it to anyone who is a market researcher or works in the retail world.